Embracing technology and innovation will be key to grasping a working future we can barely begin to imagine. Technological innovation and automation are accelerating at a blistering pace. So much so that fears of a dystopian future in which machines and artificial intelligence displace human workers are becoming commonplace. But robots and automation are only part of the story. New technology can be a pathway to a better tomorrow across Latin America and Caribbean countries – to a world with new and better jobs, not just a world with more robots. It is true that many of the low-skilled and less complex jobs are being replaced by automation. That’s why the jobs of the future will demand new, more sophisticated skills. Some studies estimate that as many as 65% of the children in primary school today will end up doing jobs that don’t even exist yet. Beyond automation, technology and innovation are reshaping nearly every aspect of our lives, and in good ways. From Tierra del Fuego to Tijuana, the biggest mega-metropolises like São Paulo to the smallest villages in Oaxaca, I’ve seen the ways in which technology is changing lives at a scale and pace rarely seen before. From assembly lines to Uber drivers plying their trade to the possession of mobiles in rural communities that not long ago didn’t have access to telephones, the use of technology has improved the lives of millions. In fact, adopting digital technology can pave the way for poverty reduction and create more, not less jobs by increasing productivity. And these productivity gains, in turn, can be a boon to low-skilled workers – not just to technologically savvy executives and sophisticated engineers. The upcoming World Bank report on the Jobs of Tomorrow: Technology, Productivity, and Prosperity in Latin America and the Caribbean shows how adopting technology enhances productivity. With more productivity, companies can lower variable costs, expand production, reach more markets, make more money and in the process create more and better jobs. Studies on Argentina, Brazil, Chile, Colombia and Mexico find that lower-skilled workers can, and often do, benefit from adopting digital technologies. Companies that use better technology increase output and often hire more high- and low-skilled workers as they expand. Take the case of online trading platforms, which can help small firms find international markets, increase their exports and thus hire more people – as small firms tend to employ relatively greater numbers of lower-skilled workers. In addition, mobile software applications make it easier to find information about job opportunities, leading to better employer-employee matches. 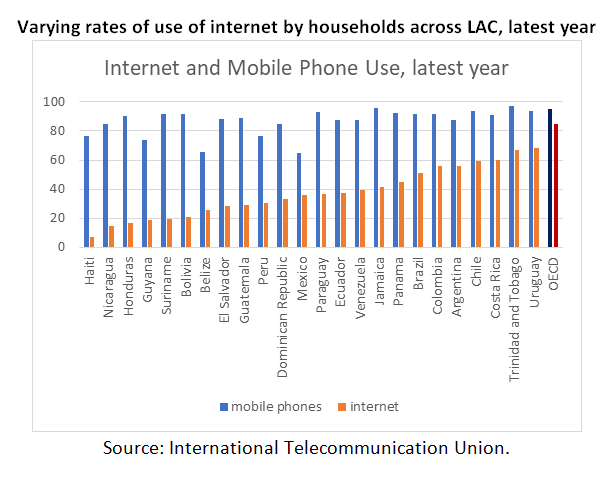 However, Latin America and the Caribbean still lag behind other regions in terms of digital technology adoption. So faster technology diffusion will be crucial as we seek to speed up and make growth more inclusive. For this to happen, let me mention two things that I think are most relevant. We should embrace and promote technology and innovation rather than build barriers. The internet is a good place to start, as it is the oxygen on which digital technologies thrive. More competition in the high-speed internet market could improve service and prices, just as reducing tariffs and taxes can greatly improve access of both companies and people to technology by making it cheaper. As an illustration of how much barriers affect prices, smartphones and tablets in some countries in the region are the most expensive in the whole world. In addition, better education and training are needed to ensure that the youth take full advantage of the opportunities created by the digital world. Without these skills, the advanced technologies could end up increasing inequality by benefiting only the highly educated and displacing those left behind. Just as the commodity boom helped the region halve poverty rates in the first decade or so of the millennium, new technologies could become a key growth engine to increase opportunities for all – not only for robots.